Difference between Challenge Type and Advocacy Type? Is the Advocacy Type applied retroactively? Advocacy Types are used to identify the actions your advocates are taking within your hub, primarily within the challenges you create. It’s important to choose the type that best describes the advocacy generated by a completion of this stage. You cannot add or modify Advocacy Types, but feel free to suggest one to our Product Team through Influitive VIP Product Feedback Discussion Forum. (None / Don't Report) We recommend using this type if you there is no advocacy being generated for this stage, or it is being generated by a stage elsewhere. No Advocacy Record will be created for this stage! Fun We recommend using this category for fun challenges in the Hub that aim to engage and entertain your advocates. Participated in a Product Beta Joined an exclusive beta group to help you test new Products or Services. Contributed to a Blog Post Helped you write a blog post or wrote one on their own. Contributed to a Case Study Helped you write a case study, ROI study, or customer story. Participated in an External Community Participated in an external community by commenting, upvoting, or posting content on sites such as Stack Overflow, Reddit, Quora, etc. Completed Educational Certification Completed a certification or accreditation provided by you for your Product, Company, or Industry. Attended an Event Attended one of your events, such as a Meetup, Dinner, Conference, etc. Spoke at an Event Spoke at one of your events, such as on a Panel, Q&A, Workshop, Webinar, Keynote, etc. Gave Product Feedback Gave you feedback on your Product or Service through a questionnaire, interview, user testing, etc. Submitted an Online Review Submitted an Online Review about you using sites such as G2Crowd, TrustRadius, Glassdoor, Amazon, etc. Joined a Reference Call Joined a reference call with a Prospect to help close a sale. Submitted a Referral Submitted a Referral for your Product, Service, or Company. Can also be used for Employee Referrals. Social Media - Other Interacted with you on another Social Media Platform such as Instagram or Snapchat. Completed a Survey Completed a survey that helps improve your Company’s offerings such as a Research Project, Data Analysis, or General Feedback. Gave a Testimonial Gave a Testimonial about your Product, Service, or Company such as a Quote, Video, or Endorsement. Completed Product Training Completed Training for one of your Products or Services. Attended a Webinar Attended one of your webinars such as a Presentation. Q&A, Workshop, Educational Session, etc. Shared Content on LinkedIn Shared your content with their LinkedIn Network. Shared Content on Facebook Shared your content with their Facebook Friends. Shared Content on Twitter Shared your content with their Twitter Followers. Followed you on Twitter Followed you on Twitter. Replied to a Discussion Topic Replied to a Discussion topic in your Program. Posted a new Discussion Topic Posted a new Discussion Topic in your Program. Generated an Upsell Lead Volunteered for an Upsell. Use this to promote additional products and services you offer in your Program to create new Upsell Leads. Generated a Cross Sell Lead Volunteered themselves or Referred an internal team for a Cross Sell Opportunity. Completed Onboarding Completed an Onboarding Program for your company. Customer Satisfaction Score (CSAT) Gave a Customer Satisfaction Score (CSAT) Rating for your Product, Service, or Company. Net Promoter Score (NPS) Gave a Net Promoter Score (NPS) for your Product, Service, or Company. Supported Other Customers Supported other customers through mentorship, community building, technical support, coaching, etc. Nurtured a Prospect on Social Media Helped you target a Prospect on Social Media by tagging them, sharing content, or answering their questions. Made an introduction to a Prospect Made a personalized introduction to a prospect on your behalf after giving you a referral. Contributed to an Ebook Helped you write an Ebook. Followed you on Facebook Followed your Company on Facebook. Followed you on LinkedIn Followed your Company on LinkedIn. Followed you on Instagram Followed your Company on Instagram. Recruited an Advocate Helped you recruit a new Advocate to join your Hub. Hosted a Webinar Was a host on one of your webinars such as a Presentation. Q&A, Workshop, Educational Session, etc. There are two reports on the Overview Dashboard that show you the trend and total number of Acts of Advocacy happening across the Hub across the time frame you filter on. Clicking on any of these numbers will give you the option to break down the advocacy by type. 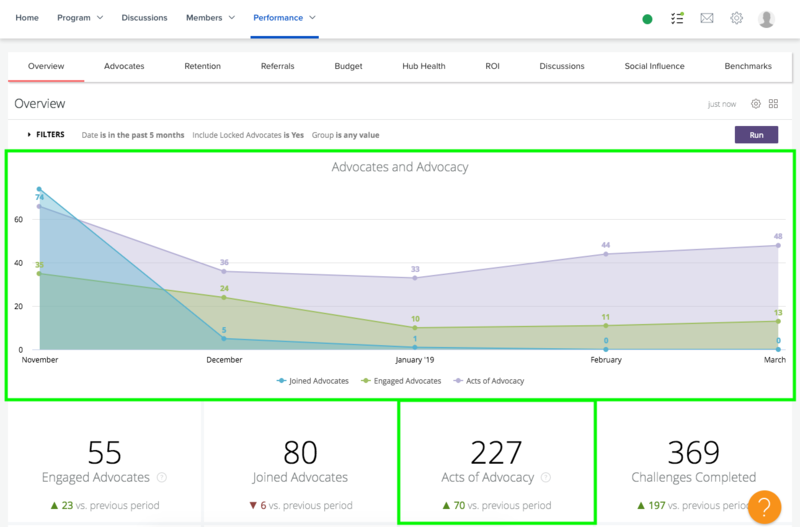 For challenges that use a Corporate Confirmation stage, admins should set the Advocacy Type on this stage as opposed to the previous stage where the advocacy happened. This way, the Act of Advocacy is only tracked if you approve it. Yes it is applied retroactively! If you change an Advocacy Type, it will automatically update past completions of that stage to reflect the new type. During our analysis of Acts of Advocacy Types, we found that there were a few values that were essentially capturing the same Acts of Advocacy and therefore merged two separate values into one Type. We also found some Acts of Advocacy Type values that were too high level and should be split into two types. Lastly, we renamed some acts of advocacies to better define the ROI that they capture. we found some values that were no longer useful and should be deprecated. The 'General' type of Advocacy was deprecated. You must now be more specific with regards to the type of Advocacy that you are generating. The next time you edit a challenge that was previously categorized as 'General', you will be asked to select a new advocacy type. 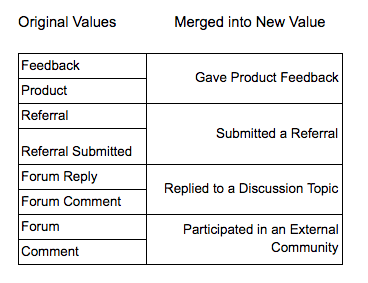 The Acts of Advocacy type 'Forum Like' was deprecated because although liking a comment does not contribute to ROI, however it is counted as an engagement.